The most recent meeting of the Roundtable on Science and Technology for Sustainability was held on November 12-13, 2015 in Washington, DC. 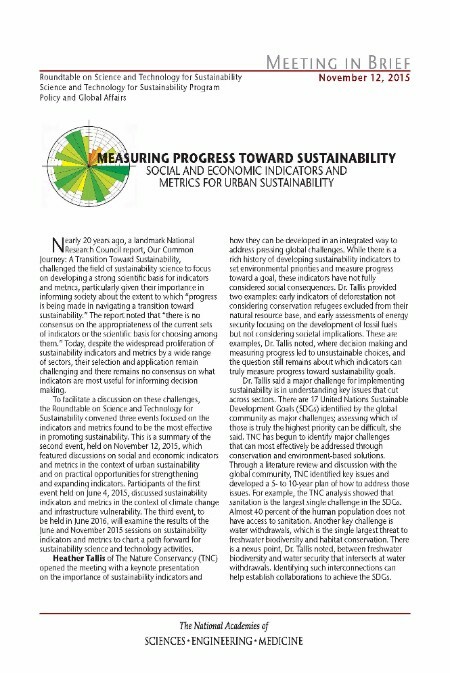 As the second event of the Roundtable’s 2015-2016 initiative, the November 12 Roundtable meeting evaluated economic and social indicators and metrics in the context of urban sustainability. The purpose of the session was to assess what indicators and metrics have been found to be the most useful for promoting sustainability as well as identify knowledge gaps related to developing indicators that integrate across the ecological, social, and economic sciences. During the meeting, panelists from government, academia, nongovernmental organizations, and philanthropic community examined examples of select social and economic indicators and metrics that incorporated various disciplines, particularly those being used to inform policy and action related to sustainability practice and research. A published summary of the event will be issued in early 2016. Our dinner speaker was Katherine Wallman, Chief Statistician at the U.S. Office of Management and Budget, who described the U.S. coordination of the Sustainable Development Goal (SDG) Indicator selection and monitoring of progress. The second day featured presentations addressing issues related to developing indicators and metrics for United Nations Sustainable Development Goals. To support the goals, the UN is preparing to catalyze a global partnership for sustainable development data, including plans to build capacity of countries to collect data to monitor and evaluate progress on the SDGs. Given the broad nature of the SDGs, it is critical that there will be a wide availability of well-defined indicators firmly grounded in science, with data that can support them, to underpin targets for each of the Goals. The Roundtable heard presentations of examples of current UN and USAID efforts related to UN SDGs process. For the session on NRC updates, Roundtable members reviewed and provided suggestions on current and planned STS program activities. Roundtable members raised suggestions for future Roundtable topics and activities. Disclaimer: This website contains unedited verbatim presentations made by meeting participants and is not an official report of the National Academies of Sciences, Engineering and Medicine. Opinions and statements included in this material are solely those of the individual authors. They have not been verified as accurate, nor do they necessarily represent the views of other meeting participants, the committee, or the Academies.